Appleton Estates Rum Tour – Shore Excursion Deluxe! Trying to decide which shore excursions to take on a cruise can be a mind boggling thing. Well, on a recent cruise which included Jamaica, it was easy for me. 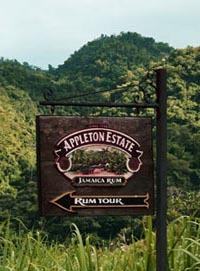 While my family was off getting freezing cold walking up the Dunn river falls, I went on the Appleton Estate Rum Tour. I boarded my van with other passengers from our ship. We traveled the route winding through the lush greenery and little villages until we entered the valley where the distillery resides. Upon entering the gates, we all could smell the sweet smell of molasses wafting through the open window. We entered the main estate building and went into the receiving room/bar area where we met our guide for the tour and were treated to a rum punch (tastes of things to come)! There is a good deal of history in the distillery. Appleton has been making rum on this site since 1749 and in that time, technology has definitely changed the production process. One of our first introductions was to 'Pez' the donkey who showed us how donkey power crushed the sugar cane from grown all over the valley for the cane juice. We saw how that juice was boiled down into a sweet-smelling tar-like substance called 'Wet Sugar.' Then we learned that it is spun in a machine to separate the cane sugar from the molasses. The sugar is not used in the rum, but the molasses is! The actual distilling room held several huge boilers, valves, and pipe works that would impress anyone from engineer to a non-technical person like myself. The time spent in the distilling room was brief due to the heat and high humidity and there were no pictures taken by anyone due to proprietary concerns. I was impressed that for the size and scope of the operation, it was very clean and seemed efficiently run. Upon leaving it we went into the coolest building in the plant, the barrel warehouse. Pity the barrels in the room were locked away or I would have carted one off for my collection. We could smell and feel the alcohol evaporating from the barrels forming the angel share (lucky angels). Each barrel in the racks that were at least 20 ft high was numbered, dated, and signed by several employees. I looked around for dates on barrel heads. The oldest barrel I could find was from 1994, but we were informed that there were some far older than that. Our guide also informed us that employees were only allowed to spend a total of 15 minutes at a time in the warehouse, due to intoxicating effects. Upon entering the main estate building again we were treated to samples of 14 different types of rum that are made by Appleton. I tried many, and since many are not sold in the states, I also purchased several bottles from the gift shop as well as shirts and other trinkets for friends and family. Our tour also included an authentic Jamaican meal which was good, because all that rum on an empty stomach would have caused a problem for many. Buzzing with excitement and rum, we all loaded our van back to the ship and headed for home. My wife was not too surprised that I came back with the quantities of items I had purchased. She knows my penchant for the rare and unusual. I have told many friends of the tour and encouraged them to go as well. Many shore excursions on cruises are the type that I am glad I went, but wouldn’t do again. The Appleton Estate Rum Tour is NOT one of those. It is one of the best travel values that I have had on a cruise ever. I will be eager for the next docking in Jamaica to visit the Estate again!